Into the deep: Three young men have taken their first steps to becoming priests for Brisbane archdiocese. They were welcomed at the Holy Spirit Provincial Seminary Commencement Mass on February 9. Celebrating the occasion are (from left) Fr Morgan Batt, Carmelite Father Paul Chandler, new seminarians Michael Tanuvasa Kelemete, Jack Ho and Sebastian Condon, Monsignor Tony Randazzo, Fr Josekutty Vadakkel and Deacon Marty Larsen. THREE young men from Brisbane started their first year in Holy Spirit Provincial Seminary “wide eyed with hopes and aspirations” last Sunday, February 9. 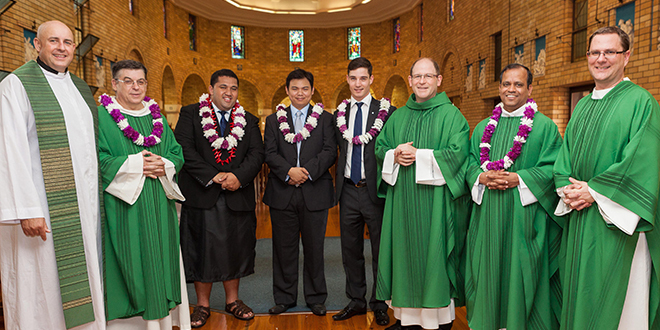 Former lawyer Sebastian Condon, 24, international business manager Jack Ho, 29, and passionate youth worker Michael Tanuvasa Kelemete, 23, entered their first year as seminarians for the Brisbane archdiocese this year. They followed in the footsteps of “several hundred priests” who had walked through the chapel doors at the seminary. The diverse background of the three young men continued to astound the seminary’s rector Monsignor Tony Randazzo, who said in any normal circumstance, you would not find a group so diverse. “It makes you wonder, what is it God sees in all of us? What is our common ground?” Monsignor Randazzo said. In his homily at the Holy Spirit Provincial Seminary Commencement Mass on February 9, Msgr Randazzo reflected on the notion image of being salt and light in the world. “Salt and light are used to develop and illuminate what already exists,” he said. In regards to the priestly mission for Mr Condon, Mr Ho and Mr Kelemete, Msgr Randazzo said life would “demand everything of you – your joy and hope, your grief and anxiety, in sum your entire life”. “Jack, Michael and Sebastian, in the seminary you will learn many things, but ultimately what you learn will only be of use if, like St Paul, you give witness to Jesus as the crucified Christ. 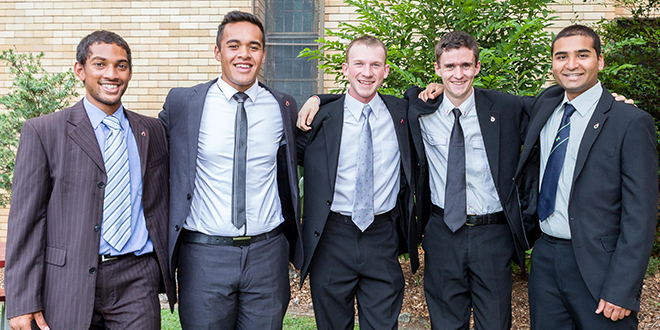 The addition of these three young men into the seminary brings the total number in the Queensland province to 26. Last year, the Queensland seminary went to full capacity at 32, with 10 seminarians being ordained as priests. Discerning: Men from Canali House of discernment attending Holy Spirit Provincial Seminary Commencement Mass are (from left) Frederick Munbode, William Aupito Iuliano, Joseph Wallace, Liam Webb and Francis Fernandes.